I have always been “into” astronomy, especially since I grew up in the Space Age while my father was in the Air Force and working at the Aerospace Medical Center at Brooks Air Force Base in San Antonio. He would bring home stories of spending time with the early rocket sled and high altitude balloon pilots. I built all of the spacecraft model kits and, from Mercury forward, I had all of the color books and magazines. I would sit in the living room with all of my stuff to watch Walter Cronkite, Frank Reynolds and Jules Bergman report on the missions. 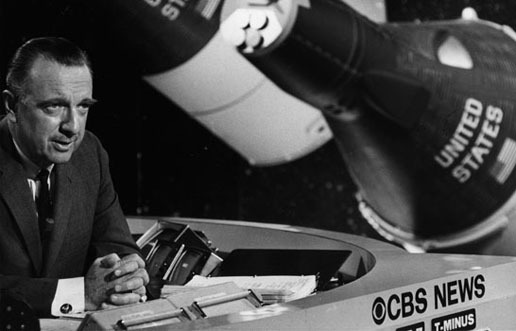 Walter Cronkite, CBS News. NASA photo. So, my viewpoint was shaped as a child of the 60s, growing up on a heavy diet of astronaut stuff, science fiction and fact books, and, of course, comics. I especially liked ones set in space or that contained facts about astronomy and physics. This means that I have been wrestling with these ideas since I could read. All of Earth’s great religions feature some notion of multiple universes or layers to the one we inhabit. Without getting into the cosmology of the Norse gods and the world tree Yggdrasil or where Superman’s home planet of Krypton was located, I’ll discuss the three prevailing models that have shaped my thinking: the Steady State universe, the Big Bang, and the Oscillating Universe. The Steady State universe as proposed by Sir Fred Hoyle, the universe that has always been and always will be, seems the easiest to dismiss, even from empirical evidence, let alone the various sacred texts like The Bible indicating a definite start to the universe, as we know it. Hoyle seems to be making an argument for intelligent design, as well. What God was doing prior to 13.5 billion years ago is one of the fundamental mysteries. (Note: However, considering that our national debt works out to over $1200 per year since the creation of the universe(! ), humans can certainly work on theoretical and practical scales to consider the concept.) Hoyle’s theory required spontaneous hydrogen to be created continuously and that added volume would account for the observable expansion of the universe. Hoyle had no more answer for where the “new hydrogen” came from than where the original densely-packed matter came from for the Big Bang in the first place. However, developments in radio astronomy provided calculations that the universe is, at the very least, quite unsteady. Or was it really the first place? The Oscillating Universe model suggests that the universe “breathes,” expanding and contracting like a bellows. It seems more to me like a balloon that inflates and deflates. Since it has been observed that the galaxies are moving away from each other, there must logically be a point of origin. Therefore, at least one Big Bang has been accounted for. If the rate of expansion is increasing, then it may be that the matter of the galaxies is moving further and further from the point of origin and the pull of gravity is less. However, Feynman has presented a mathematical argument that gravity’s force has remained constant throughout the life of the universe so it could not be contributing to an increase in the velocity of galactic movement unless there is a greater gravitational force pulling from some point unseen. However, the Oscillating Universe is the cosmological view that makes the most sense to me. Empirical observations and measurements indicate that we are in the (a?) phase of expansion as the galaxies move away from each other. Even the material within the galaxies is in a period of expansion, according to Hoskin, and contraction with dynamic internal tension. If the universal material hits its limit (due to loss of acceleration or eventual “impact” against dark matter surrounding our universe), then it can fall back or be attracted back to its point of origin. All of the material re-compacts into a Big Crunch that is the compacted star-stuff for another super-heated Big Bang. Since “our” universe contains many pulsars, the antecedents to black holes, our universe may be pumping out new universes into parallel universes all over the places. It is as if our expanding universe is a golf ball and the dimples could be the black holes. Being in three-dimensional space, our universe would need to be golf balls within golf balls, like Russian matryoshka nesting dolls, with a one molecule layer between each ball. These layers are like membranes and perhaps such a membrane is the balloon skin that will snap back 14 billion years from now and pull all of the stuff back into another Big Crunch. None of these postulations answer my overarching question? Where did the star-stuff come from in the first place? No matter if it is primordial hydrogen and helium or God making a “universe meatball” with his infinite hands, it had to come from somewhere. That is the plane of understanding that still demands my attention. Each black hole might be the device that acts like a trash compactor to receive, squeeze, and squirt down to a parallel dimension the hyper-crushed material that is the superheated nugget for a new Big Bang to kick-start a new universe. Every succeeding universe would then be smaller compared to the universe above that birthed it. Superstring theory, as described by Michio Kaku suggests that this is not only possible but provides a potential answer to where “our” universe’s star-stuff came from, that the membranes surrounding two universes collided and that frictions rubbed off the material that sparked 13.5 billion years ago. This entry was posted in Personal and tagged Bible, Big Bang, Big Crunch, Brooks Air Force Base, Carl Sagan, Jules Bergman, krypton, Metric expansion of space, Michio Kaku, Oscillating universe, Richard Feynman, Sir Fred Hoyle, Space Age, superman, Walter Cronkite, Yggdrasil. Bookmark the permalink. 1 Response to The Big Bang Theory: Singular or Plural? Enjoyed the article. For decades I’ve thought that “The” Big Bang has occurred more than just the one time . Expanding then contracting then exploding starting the process all over again .